Greenbelt invited me to speak at the festival this year and, if you have never been nor heard about it, you won't know what an honour that is. Greenbelt is huge - about 20,000 people attend for a four day festival of music, craft, debate and Christian fellowship of all colours. I am not a Christian and they invited me anyway which is pretty cool in itself. It's slick, professional, and smart. The people who attend, if my session was anything to go by, are intelligent, challenging, and interested, all of which made it one of the most worthwhile speaking engagements I have ever had. Below is the long form of the speech I made but sadly I cannot include the stimulating conversations that occurred after I was done talking. 1. Our society is relatively free and safe. 2. We are not constrained by petty day to day laws and regulations. 3. The growth of social media means we have extraordinarily powerful communication tools at our fingertips. 4, There has been a wholesale shift of consciousness caused by the financial crisis of 2008 leading to a celebration of creativity and community. All of these things combined mean that there is a real possibility we can change the world for the better whilst earning a living and feeling fulfilled and happy. The excessive capitalism and consumerism of the past couple of decades caused both a financial and an existential crisis in that they exposed a set of behaviours - both in ourselves and our leaders - with which we can no longer live because they disillusioned and disgusted us. Leaders in all walks of life showed us naked greed, flagrant rule bending and cavalier treatment of colleagues. We depended on goods and services, many of which we could not afford, that were created far away and out of our control, and when our reliance on steady employment and certain wealth accumulation evaporated it was like we woke up from a fifty year sleep walk. We realised we were lonely and unfilfilled, frightened and angry. However, capitalism and consumerism are not wholly to blame. In fact they will be our saviours if we learn to exert more control over them, and not the other way around. There is a lot to be said for capitalism. It encourages competition, creativity and productivity and it creates wealth which enables, among many things, philanthropy. There is also a lot to be said for consumerism which creates jobs and distributes wealth far more effectively than government does. To that end, capitalism and consumerism are not the problem. We are. And we have to change if we want to have any hope of a happy and stable future. Nobody put a gun to anybody's head and forced them to take out a cheap loan to buy a new car or the latest flat screen TV. However, it is undeniable that societal pressure at that time was considerable. Success, in the main, was measured by what you had rather than who you were and the resultant greed and envy fuelled the financial bubble. Office jobs, corporate ladders, celebrity and "stuff" were the measures of success and most people conformed because that was the way things were and the unspoken social contract was clear: do this and you will be successful, happy, and feel fulfilled. Post crisis, the world was fuelled initially by fear and anger, and it is whether or not individuals can move beyond this stage in the grieving cycle that will either make or break them. Some people continue to rant and rave, blaming business leaders, blaming politicians, blaming anybody and everybody - and not taking responsibility for their lives and future. Others are changing their world view and accepting responsibility for their own lives, making better decisions, seeking out the things that make them happy, and doing things that make them feel more connected to themselves and others. It is not easy to make a switch from a world where everything was given to us to a world where we have to make our own opportunities but it is a switch we have to make and when we do, we will control capitalism rather than letting it control us. - setting up social enterprises: "third sector" companies that are dedicated to improving society and creating wealth in a socially responsible way. The "enterprise" bit of social enterprises requires that they can and should be tax paying, fiscally responsible, transparent, and open - and must be professionally and prudently managed to be so. The "social" bit of social enterprises means that their primary function is to benefit society rather than maximising shareholder value, and they do so by making money responsibly and spending it wisely. Social enterprises meet the emotional needs of people who work for them because they are working to change the world by effecting positive social change. They meet the rational needs by paying a wage. In short, social enterprises are the perfect vehicle for people to make their own employment opportunities doing what they love, when part of what they love is effective positive social change. It is possible to change the world for the better in an infinite number of ways. 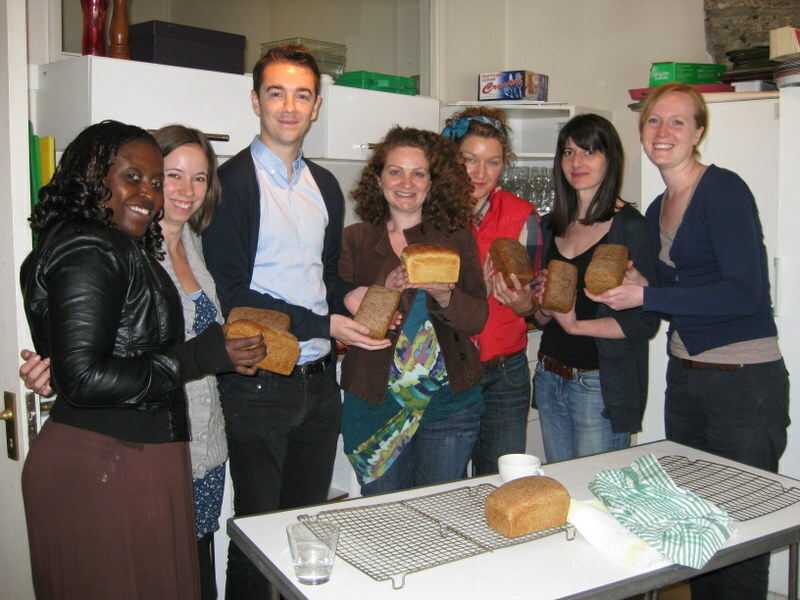 Virtuous Bread does it by teaching vital life skills (baking bread) and building communities through good bread. Everyone connected with Virtuous Bread is passionate about bread and community building. We all earn some money working at something about which we are passionate. We can only do this because of the hopeful time in which we live. 1. Our society is relatively free and safe and this means we can hold classes that booked on line by strangers. They can travel safely to the classes and we do not fear them. 2. We are not constrained by petty day to day laws and regulations so we can bake at home and need no formal qualifications to do what we do. The market decides - if the premises pass hygiene standards (which are sensibly regulated) and the product is good, we will sell bread. If the classes are useful and value for money, people will attend them. 3. The growth of social media means we have extraordinarily powerful communication tools at our fingertips which make it possible for us - for free - to raise awareness, build a brand, market, advertise, and sell their products and services. 4. There has been a wholesale shift of consciousness caused by the financial crisis of 2008 leading to a celebration of creativity and community so that people actually think that bread is groovy, that what we do is great and they want to learn to bake. This was completely unthinkable even three years ago when the only great thing to do was earn as much money as possible, eat at restaurants and buy pre-prepared food. It is entirely unclear whether this time will last. On the one had, there is more of an interest than ever in happiness - it is being studied, written about, and discussed as never before. Even The Economist magazine - the guardian of the free market economy - is publishing statistics about happiness. On the other hand, humans have always proven to be bad learners and so perhaps this is just a swing of the pendulum and in ten or twenty years time we will all be back climbing the corporate ladder and buying things we cannot afford. The main point is that we have to embrace our time, take advantage of it, and enjoy it. With this wild and precious life that we have we can build a business doing something we love, make money by sharing our passions, find and engage with people from all over the world on topics about which we care and change ourselves and the world around us for the better. We can do this because of the times we live in. They are capitalist and they are consumerist but they don't need to be bad.